Alpha & Omega Independent Car Repair is Boulder’s best choice for superior steering, suspension, and alignment services. We are a family-operated, full-service automotive shop with over three decades of experience and thousands of loyal customers throughout Louisville, Longmont, LaFayette, and surrounding communities. They have come to rely on us for our honest estimates, expert guidance, and exceptional workmanship. 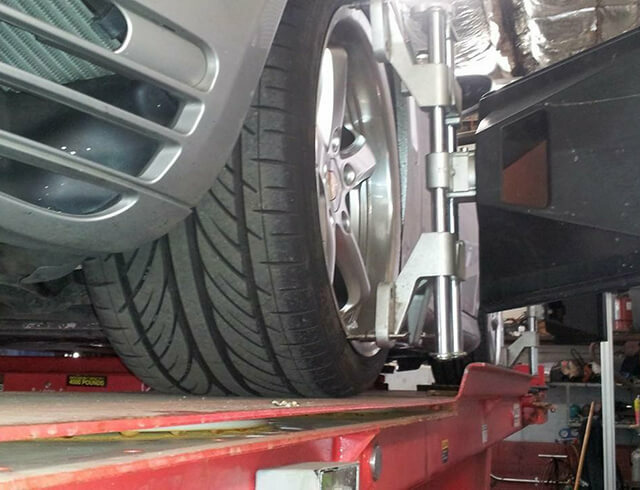 Our dedicated mechanics are led by an ASE-certified Master Technician, who has over 36 years of experience in performing wheel and tire alignments, steering system repair and maintenance, suspension modifications, and strut and shock replacement and repair. With our extensive knowledge and experience, our team is qualified to work on all makes and models of Japanese and European imports. We're so confident in the quality of our work that we stand behind nearly all of our repairs with an industry-leading 3-year warranty on parts and labor. Whether you need a power steering pump replacement for your Audi R8, tire balancing and wheel alignment for your Subaru Forester, or new shocks for your Honda Accord, we have the skills and expertise to get the job done right, the first time. Our Boulder auto shop is equipped with the latest automotive technology, including advanced diagnostic tools and state-of-the-art alignment racks. 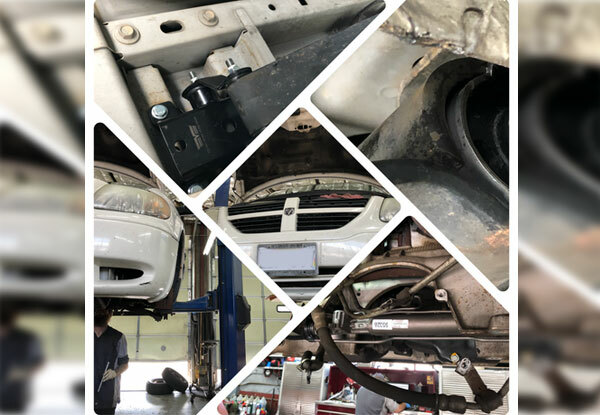 Unlike many other auto repair shops, we have the capability to complete a full range of steering, suspension, and alignment services entirely on-site. In fact, we often receive referrals from automotive shops who don't have the same ability to perform the work we do, and counsel insurance companies and auto body specialists on repairs for damaged vehicles. We can even do full frame swaps for most cars and trucks, which involve rebuilding the entire frame from the ground up. Whatever the scope of work, our customers can rely on us for precise measurements and superior workmanship. This ensures that every vehicle has the proper alignment and superior traction necessary to safely navigate Boulder's icy winter roads and steep hills. Because of our commitment to quality and consistency, we prefer to use genuine Original Equipment Manufacturer parts for our car repairs whenever possible. However, we will always work with our customers to find a cost-effective solution that fits their budget and gets them safely back on the road as quickly as possible, usually within 24-48 hours. Stop by or call our Boulder auto repair shop to schedule an appointment. We are conveniently located near LaFayette, Louisville, and Broomfield, and offer complimentary shuttle service within the city limits of Boulder. We can also arrange after-hours drop-off and pick-up services upon request. Simply a great auto repair shop. Trustworthy, friendly, helpful, and efficient. They take the time to share recommendations and explain repairs. Tie Rods and Alignment: We replaced a seized tie rod assembly with a new one on a nicely outfitted Jeep Sahara. 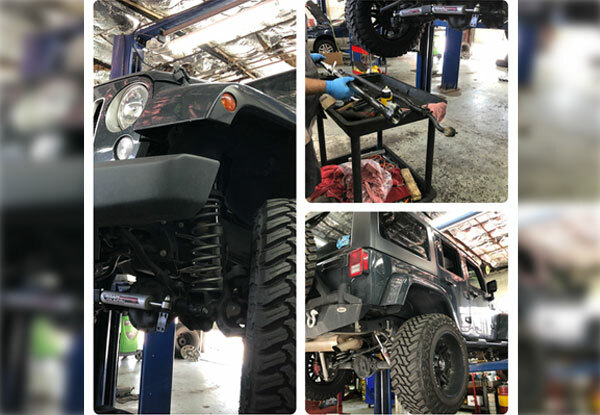 Once replaced with a genuine Mopar replacement tie rod assembly we will perform a four wheel measure and align this Jeep to the perfect alignment. We are refreshing the old tired worn leaf spring suspension with new bushings, shackles, and hangers.